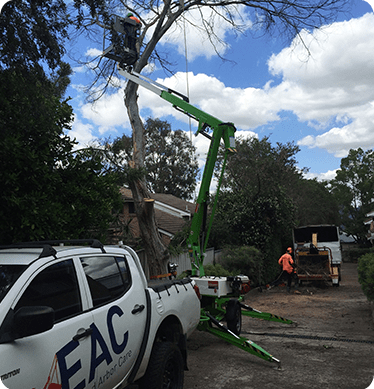 With over 15 years experience in the tree industry, EAC is well placed to look after all tree lopping, stump grinding, crown lifting, tree removal & tree cutting jobs. Based in Western Sydney we aim to provide a professional prompt and efficient service to Mulgoa residents. With Mulgoa being such a beautiful part of Western Sydney, you don’t want to trust your trees to anyone less qualified, than a fully qualified Arborist. If you have a tree that needs to be removed, or trimmed our staff quickly and safely complete the job including removal of small and large trees. With the latest equipment and techniques for tree removal, we pride ourselves on our Customer Service and Safe work practices. Here at Elevated Arbor Care we take pride in our work and are always striving to satisfy our many Mulgoa Customers. If you live in Mulgoa and only want the best when it comes to your property, give our team a call today. Mulgoa is a known area for lush greenery and expansive space, and if you’d like to utilise your space without the worry about a tree that may drop branches or hinder the underlying foliage we are there to help with your tree removal. Don’t risk costly repair bills from a tree that has outgrown its welcome. Our Arborists can give you the right advice the first time, meaning your property, your tree and your family are in the best of hands. We also offer all other tree services in and around Mulgoa, whether you need a cleanup, trimming of a large tree, or stump grinding Elevated Arbor Care are here to help. Call us on 1300 007 674 for any tree removal in Mulgoa for a free quote. Tree stumps can be an eyesore, not to mention a constant trip hazard. If we are removing a tree for you, or you’ve had it taken out in the past, ask us about our stump grinding services. We make light work or what could otherwise be back-breaking digging and hauling. Don’t spoil the view with an unsightly stump, have it removed with our professional and efficient stump grinding machine, leaving you with nothing more than some great mulch for the garden. Elevated Arbor cares Stump Grinding services in Mulgoa can help you remove the stump once and for all. And don’t worry about your grass, when we grind the stump we can remove the whole stump to beneath ground level so the grass can regrow and you would never know a tree existed in that area. Our teams of expert Arborists have the knowledge and specialised equipment to make light work of your old tree stumps. Our tree stump grinding services are amongst the most qualified and reliable services in Mulgoa. We can stump grind in any area, with any access levels, even tight access or sloped land. Do You Need Our Tree Services In Mulgoa? Call our professional team today and we will come to you and give you and provide you with an obligation free quote and recommend the tree services you need to clean up your block and make the most of the land you call home. Whether it be tree cutting, tree clearing, tree felling or stump grinding, we have the knowledge, equipment and manpower to get the job done.